During the 4 or 5 years that I struggled with the content of the book The Mystical Hexagram, which was all received in meditation, I understood that this material was important. I also understood that the approach, using the symbol of the hexagram to cast light on a variety of other magical systems and techniques would appeal to just a small number of people. In the end, I took the use of the symbol only so far and stopped short of where I had intended to go with it – which was to look at what it meant also in alchemical terms. The reasons for this is that I am not expert enough in many areas to trust what was coming through sufficiently to commit it to paper and the record. Early in the process of compiling the thoughts and ideas in the book, I had abandoned any cross checking with other literature in the field – mostly down to laziness if I am honest but also because, in the end, we must trust our own instincts and not always rely on confirmation from an external counterpoint that may in fact be in error too. If it sounds to you as if I contradict myself here, you are probably correct but what I am try to say is that I dare only go so far in trusting my own inner access to knowledge and my attempts to understand what it meant. Eventually, I teamed with Sue Vincent to complete the book and her contributions were critical to making the work whole as it stood. But the book isn’t finished and I had doubted that I ever would be able to complete it….. until this morning. This morning, I read an interesting article on Facebook by Emmanuel Rose around excerpts from Ripley’s First Gate. In this post, Emmanuel Rose writes an explanation of a part of the text..The stages of the alchemical process are to turn earth into water, water into air, and air into fire. These are symbols of the cooking process. They also represent the four-fold process of changing Jing into Chi into Shen into Emptiness. Or if you will, Nephesh into Ruach into Neschamah. The internal energies of the body are circulated so that the subtle water and fire mix. This is pictured in tarot Key 14 in the Case deck wherein the water is poured on the lion, symbolizing fire, and the fire is poured onto the eagle, symbolizing water. This circulation is somewhat similar to the Middle Pillar technique or the Taoist microcosmic orbit, though not identical. The “Wheel of the Elements” is an almost obvious reference to tarot Key 10 which pictures the process of internal alchemy. It is not an accident that it is attributed to Jupiter which rules Sagittarius, attributed to Key 14. (My thanks to Emmanuel Rose for posting this). The Hexagram is also the key to this process. The exercises that I found myself instructed to perform are a circulation similar to the Middle Pillar. I am so close to a major breakthrough that I can feel the energy but I cannot explain it. 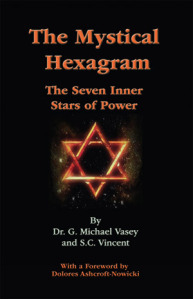 The hexagram and its 7 points or stars or metals, when looked at in a certain manner that takes into consideration the polarities demonstrated in it and also some of the other aspects of the symbol and its meanings, is a key to unlocking the Great Work of Alchemy. Of this, I am sure.